Mass resolution of 0.00x amu. Particles particles with the same nominal mass (e.g. Si and C2H4, both with amu = 28 ) are easily distinguished from one another because as Mr. Einstein predicted there is a slight mass shift as atoms enter a bound state. Mass range of 0-10,000 amu; ions (positive or negative), isotopes, and molecular compounds (including polymers, organic compounds, and up to ~amino acids) can be detected. Trace element detection limits in the ppm range. 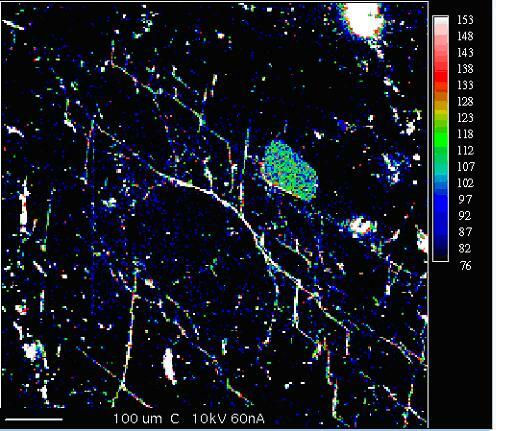 Sub-micron imaging to map any mass number of interest. 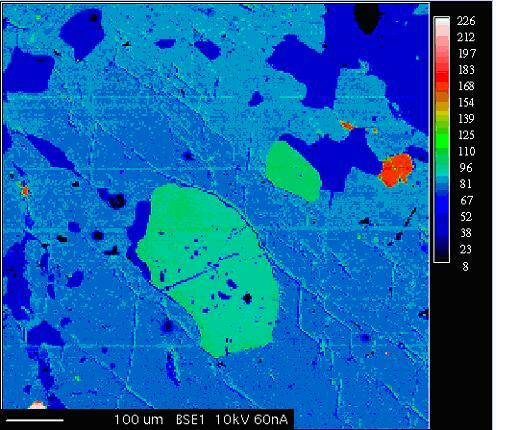 Depth profiling capabilities; sequential sputtering of surfaces allow analysis of the chemical stratigraphy on material surfaces (typical sputtering rates are ~100 A/minute). Retrospective analysis. Every pixel of a ToF-SIMS map represents a full mass spectrum. This allows an analyst to retrospectively produce maps for any mass of interest, and to interrogate regions of interest (ROI) for their chemical composition via computer processing after the dataset has been instrumentally acquired. 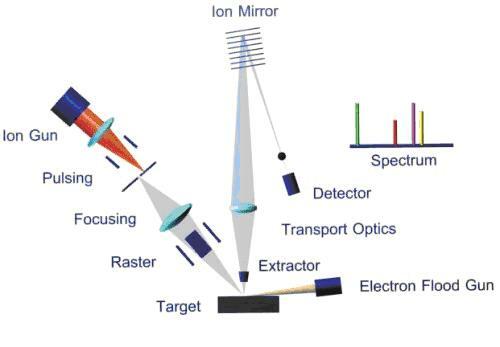 depth profiles are produced by removal of surface layers by sputtering under the ion beam. 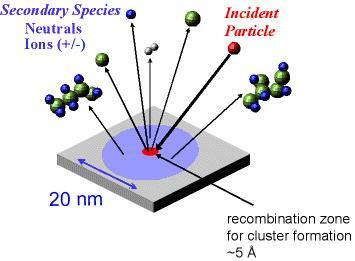 ToF-SIMS is also referred to as "static" SIMS because a low primary ion current is used to "tickle" the sample surface to liberate ions, molecules and molecular clusters for analysis. In contrast, "dynamic" SIMS is the method of choice for quantitative analysis because a higher primary ion current results in a faster sputtering rate and produces a much higher ion yield. Thus, dynamic SIMS creates better counting statistics for trace elements. Organic compounds are effectively destroyed by "dynamic" SIMS, and no diagnostic information is obtained. 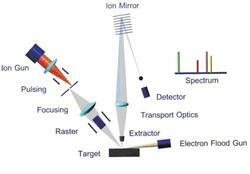 Time-of-Flight Secondary Ion Mass Spectrometry (ToF-SIMS) Instrumentation - How Does It Work? ToF-SIMS instruments are also equipped with a powerful computer and software for system control and analysis. One of the key features of the ToF-SIMS software is the ability to perform "retrospective" analysis, that is, every molecule from the sample detected by the system can be stored by the computer as a function of the mass and its point of origin. This allows the user to obtain chemical maps or spectra of specific regions not previously defined after the original data has been collected. Strengths and Limitations of Time-of-Flight Secondary Ion Mass Spectrometry (ToF-SIMS)? 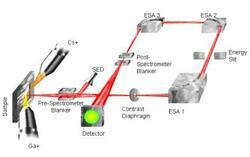 Retrospective analysis, for post-data acquisition analysis and interpretation of stored images and spectra. Too much data; the benefit of retrospective analysis is also its curse. Every pixel of an image produced by ToF-SIMS also contains a full mass spectrum for that point. Thus, it may take hours, days or weeks to fully analyze a single data set. Consequently, it is extremely important to have a very clear purpose in collecting ToF-SIMS data, and focus on analyzing and interpreting the data that are specifically related to the question at hand. ToF-SIMS is extremely sensitive to any sample preparation treatments: there is typically a residue related to any pre-treatment of the sample, and there is always "adventitious" (or environmental) contamination in the form of compounds sorbed onto material surfaces from the atmosphere. In general, we try to analyze samples "as received." Solid materials (e.g. mineral grains) are typically pressed into an Indium foil, which is both malleable and conducting. Any mapping of the sample prior to insertion into the sample chamber will greatly increase the ability to find and identify areas of interest. As a first step in the analytical procedure, we will typically "dust off" the surface with a very light (<1 minute) sputtering interval in an attempt to clean off any sorbed surface contamination. 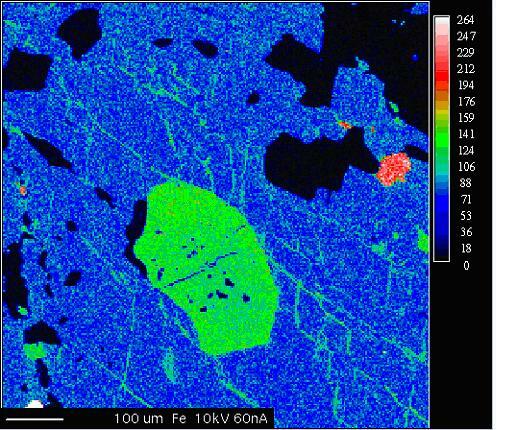 An example of ToF-SIMS elemental mapping of a garnet amphibolite from the KTB deep borehole, Germany. 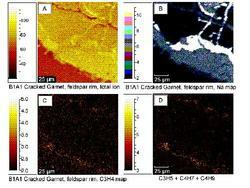 An anastomosing network of carbon can be seen on grain boundaries and cleavage traces. From Mogk and Mathez (2000). Benninghoven, A., Chemical Analysis of INorganic and Organic Surfaces and Thin Films by Static Time-of-Flight Secondary Ion Mass Spectrometry (ToF-SIMS), 1994, Angewandte Chemie International (in English), vol 33 #10, 1023-1043. VanVaeck, L., Adriaens, A., and Gijbels, R., 1999, Static Secondary Ion Mass Spectrometry: (S-SIMS) Part 1. Methodology and Structural Interpretation, Mass Spectrometry Reviews, v. 18, p. 1-47. Adriaens, A., VanVaeck, L., and Adams, F., 1999, Static Secondary Ion Mass Spectrometry (S-SIMS) Part 2: Material Science Applications, Mass Spectrometry Reviews, v. 18, p. 48-81. Mathez, E. A., and Mogk, D. W., 1998, Characterization of carbon compounds on a pyroxene surface from a gabbro xenolith in basalt by time-of-flight secondary ion mass spectrometry, Amer. Min., v. 83, p. 918-924. 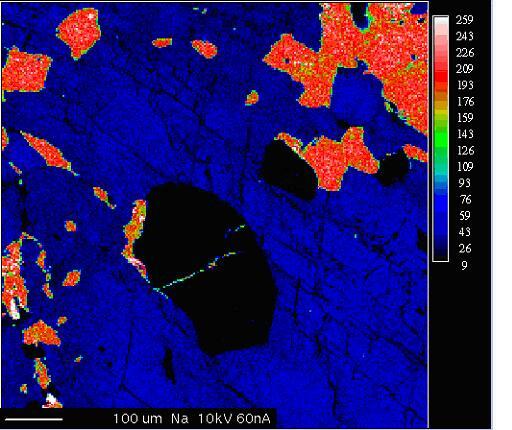 Mogk, D. W., and Mathez, E. A., 2000, Carbonaceous films in midcrustal rocks from the KTB borehole, Germany, as characterized by Time-of-Flight, Geochemistry, Geophysics, Geosystems (G3), Amer. Geophys. Union, November 13, 2000 (e-publication). Toporski, J., and Steele, A., 2004, Characterization of purified biomarker compounds using time of flight secondary ion mass spectrometry (ToF-SIMS), Organic Chemistry, v.35, #7. 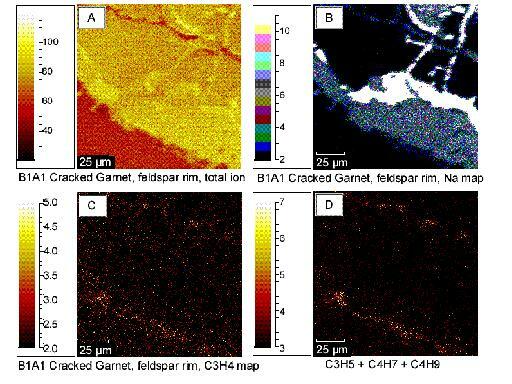 Xiaoquiang Hou, Deyi Ren, Heling Mao, Jiajin Lei, Kuli Jin, Chu, P.K., Reich, F., and Waynde D. H., 1995, Application of imaging ToF-SIMS to the study of some coal macerals, International Journal of Coal Geology, v. 27 #1, p 23-32. Scott, S. D., and Yang, K., 2007, Melt inclusion evidence for magmatic fluids as a source for metals in seafloor hydrothermal systems, Geophysical Research Abstracts, Vol. 9. Stephan, T., Jessberger, E. K., Kloeck, W., Rulle, H., Zehnpfenning, J., 1994, ToF-SIMS Analysis of Interplanetary dust, Earth and Planetary Science Letters, v. 128 #3-4, p. 453-467. For more information about Time-of-Flight Secondary Ion Mass Spectrometry (ToF-SIMS) follow the links below. Teaching activities, labs, and resources pertaining to Time-of-Flight Secondary Ion Mass Spectrometry (ToF-SIMS).